The booth. 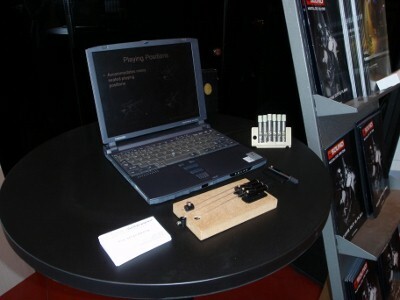 I had created a self-running presentation of ergonomic guitar design that was on display along with the mock-up bridge display that I had completed only hours before the show. The mock-up showing the logo base mounting plate and the regular mounting plate. 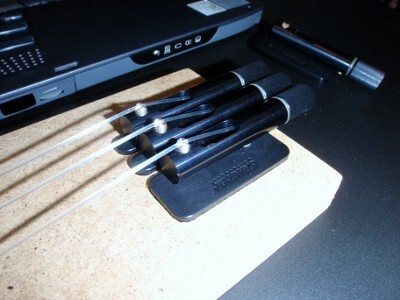 Yes, they are nylon strings, that I put in there only to save the mock-up from being broken by possibly rough handling. The string lock. This might require some explaining. the picture shows it mounted in three alternative positions. It can be mounted (from top to bottom) on top of a head, along the side of a head construction or inside holes, e.g. the existing mounting holes from tuners that have been removed. I have designed them to be 10 mm wide, meaning that they will fit into most tuner holes. Only available in black. Planned colors are black, blue, red, gold, silver. The rear end of the main housings have a slight “tremor” for lack of a better word in the finish. This will be corrected in future batches. So I am now taking orders, finally. For now, please send me an e-mail to order. I will create a proper product page ASAP. Introductory price, considering the finish problem and the fact that I have not yet worked out proper packaging, etc. is €35/string. This includes the string lock and tuner/bridge. Each purchase comes as standard with a single logo mounting plate (18×45 mm) and the rest of the mounting plates 8×45 mm, i.e. a kit of 6 comes with 1 wide logo plate and 5 regular. I promise a generous (but tons of questions asked) warranty policy since it is a “1.0” product. Watch this space for announcements about more color options and the availability of the Floyd-Rose drop-in replacement version. This is very exciting. It is wonderful to watch you take the EGS public! What did you learn from talking to people at the guitar festival? How was that experience different from interacting online? It was fun and it was a shame that I didn’t have more time to spend there. In preparing the mock-up, all I had at hand in the limited time was some old nylon strings as you can see in the pictures. The largely classical guitarist visitors were a bit confused. A lot of time was also spent on watching people trying to figure out how a torsal twist neck could actually work in reality. I got to develop a pretty good elevator pitch. I am personally not fond of being jumped by sales people at these types of functions, but I took every chance I had to talk to anyone who so much as slowed down at the booth, so I needed a quick explanation of the concept. I received quite a few positive comments, and besides the concepts being appreciated, I think people enjoyed meeting a small and enthusiastic local player. Heh — “baptism by fire” is the term I think we’re looking for. So difficult to explain technical concepts to casual visitors without them getting that glazed look. I personally liked your nylon string mock-up. Definitely short scale, though. Firstly I must congratulate you for the great development work(s) you’re carrying on. Well, just to finish, I see that you’re experimenting with knife edges, however I believe it would be a much better alternative if you’d look for kind of a needle bearing option, as you have optimal machining resources within your reach. thanks for your comments. The main feature I was looking for when designing the string lock was versatility. I wanted to be able to cater not only to the needs of luthiers building instruments with any number of strings, but also to those who don’t like headless guitars because it feels unbalanced. For them, this design presents a compromise still with a significant weight-reduction and improvement in balance. For those who decide to replace an existing bridge, it offers a not-so-invasive solution to creating a new instrument. The current tremolo design is intended to fit existing Floyd-Rose mounting posts for those who want to remove weight from an existing instrument, and/or want a headless instrument. In addition, most guitar builders out there already have routing templates for Floyd-Rose tremolos, so it should make an easy transition. I appreciate your comments a lot and will continue to design and take new things to the market! Thanks for your response and for the explanation about the broad range of guitarists you want to cater for your modular string lock system. 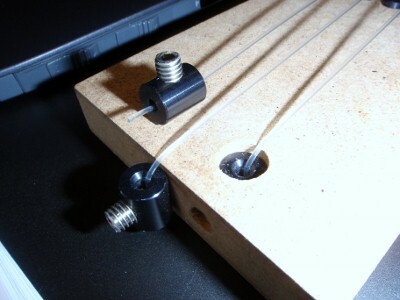 Now regarding the (needle) bearing alternative I’ve suggested for your tremolo, it is possible to make this for using with the very same fulcrum trem bushings and the very same cavity routings, the only thing that changes is the post/baseplate interface. If you’ll see those Vigier mods, you’ll see exactly what I mean. Vigier do not sells the complete trems nor posts/inserts combo as replacements, so there is an open market for tremolos featuring this much positive design detail (as it is quite precise, sturdy and doesn’t wear, unlike regular posts/knife edge systems do). I’m picking up the finished parts in the next few days as well. I’ll try to get and scan a drawing (cut) from the now vintage Yamaha RM Pro tremolo, this one has quite small ball-bearings. Parker, and Steinberger S and T tremolos also do have ball-bearings (in these cases bearings are bigger sized). One of the reasons why some people say that needle-bearings are better than ball-bearings, it’s because of the very small angle within the tremolo action travels, so the tiny pressure points of balls end up to carve a groove (we’re talking 1/100mm or so) due to the strong, permanent and unilateral pressure inside the bearing, always depressing the very same balls (as these do not turn around neither spread grease, rather push it off), so this ends generating some slack across the time. Needle bearings do have a line contact of course, also retain lubrication well, and it seems that Vigier could get very thin needle sleeves for his modded bridges, as the bearing outside keeps very compact indeed. I’ll keep waiting for seeing what you may experiment, I’ll try to figure out something on my side too, as this interests me a lot. I would love to see anything you can get your hands on. I see the benefits of needle bearings but have been unable to find any of the small dimension that I would like in the current design. The bearings I received yesterday are ceramic hybrid bearings and should be easier rolling, less sensitive to poor lubrication and more durable. I will get to work on a prototype as soon as I can. Yes, keeping the pivot system small enough to be fully compatible with the original stud inserts and with the original routings of FR-type tremolos, means to have to get very small bearings, but if others did get these, they you’ll get as well, just a question of searching enough. After I’ve left my previous post here, I looked at what Google might find out about micro bearings, and some have shown up. Anyway the bearings you’re going to test seem to be much sophisticate and pretty resistant to wear due to the nature of material used. It’s also worth checking two other tremolos, the Ibanez ZR tremolo and the newest Kahler 7170 (kind of a Wilkinson VS100 with some bearings inside of a front sleeve, with regular studs at the ends of the sleeve).